Crofts Estate Agents are delighted to be offering to let this fantastic Darlington Court development located in this prominent main road position in Cleethorpes with local amenities nearby and a short distance from Cleethorpes seafront. Darlington Court is a brand new development of ten, three storey, four bedroom town houses which offer contemporary and luxurious accommodation perfect for family occupation. Number 9 is a mid-link end town house and really must be viewed, having an open plan living/kitchen area which is complimented with a gorgeous selection of modern fitted units with a selection of integrated appliances (oven, hob, extractor and dishwasher) it is dual aspect and flooded with natural light. The accommodation briefly comprises entrance hall, open plan living/kitchen area, cloakroom on the ground floor. 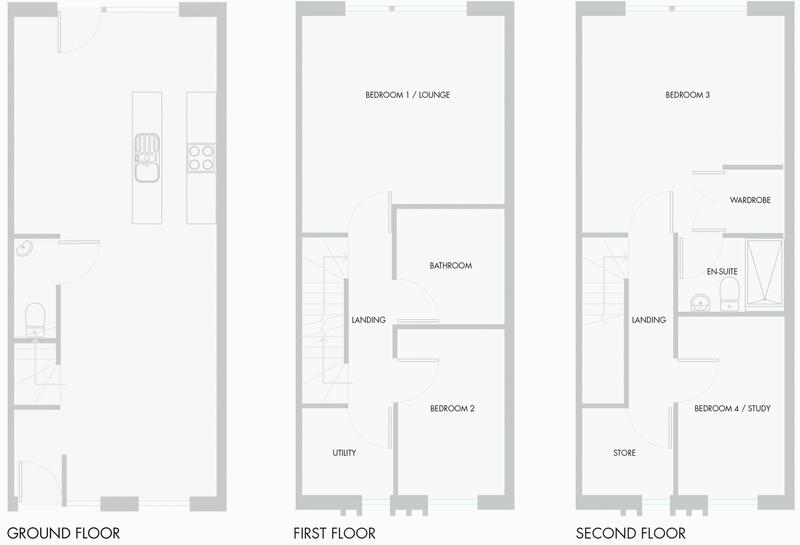 On the first floor are two bedrooms, useful utility room and the family bathroom complimented with luxurious fittings featuring a roll top bath with shower over. On the second floor there are two further bedrooms including the master bedroom which enjoys delightful views and has the benefit of a superb en-suite shower room again with high quality modern fittings. It has the benefit of electric central heating provided by an energy efficient heating system and aluminium double glazing. Garden and allocated car parking space to the rear. This is a fantastic open plan contemporary living space with dual aspect windows flooding this area with natural light. Two window units and aluminium double glazed French doors to the garden. Oak flooring, recessed spotlights and coving. The kitchen area compliments superb modern units, an island and dressed with smart work surfaces and incorporating a sink unit with drainer and mixer tap. Electric oven, hob, extractor and dishwasher. Three radiators. With radiator. Stairs to second floor. With recessed spotlights, radiator and aluminium double glazed window unit. With radiator and aluminium double glazed window unit. With recessed spotlights. Plumbing for automatic washing machine. Radiator and aluminium double glazed window unit. With tiled floor, recessed spotlights to ceiling and fitted with a beautiful suite comprising bath with shower over, low-flush w.c. and hand basin set in vanity unit and aluminium double glazed window units. With recessed spotlights, two aluminium double glazed window units and a radiator. Access to. Having double shower cubicle with glazed door and shower, part tiled floor, partially tiled walls and fitted with a low-flush w.c. and pedestal basin. Recessed spotlights and coving. Heated towel rail. There is a dressing area off. With electric "Ariston" central heating system. Aluminium double glazed window unit. The property has gardens to the rear being nicely enclosed with timber fencing, lawn, bin store and slab path to patio doors.